The Devonian Period was so-named in 1839 by geologists Adam Sedgwick and Roderick Murchison, after the county of Devon, England, where the rocks of this period were first studied. The Devonian, from 417–359 million years ago, witnessed major changes in plant life and fish, including some fish that ventured on land. Oceans covered 85 percent of the globe, and there were two supercontinents: Laurasia in the Northern Hemisphere and Gondwanaland in the Southern Hemisphere. The first land plants appeared some 450 million years ago, and the oldest vascular plants appeared at the beginning of the Devonian. Unlike the earlier nonvascular plants, such as liverworts, ferns, and moss, vascular plants have an extensive system of tubes that transport water and nutrients throughout the plant. During this time, vegetation was simple, limited to the water’s edge, and consisting of small plants, the tallest a mere 3 feet (1 meter) in height. Wood appeared, increasing axial strength, permitting trees to grow taller to reach open sunlight and support the greater weight of branches and leaves. Changes in the soil promoted the development of plant rooting systems; some 385 million years ago, the first tree-like organisms growing in forests were in evidence. A REVOLUTION IN THE BIOTIC WORLD. During the Middle Devonian, the agnathans (jawless fish, with plate-like armor) started to decline in number. Jawed fish, such as the shark-like cartilaginous fish and the vast majority of extant bony fish, increased in number and variety and became the dominant marine and freshwater predators; this period has been justifiably called the Age of Fishes. From the lobe-finned jawed fish evolved the earliest tetrapods, which were able to crawl from the mud and move about out of water to feed on terrestrial invertebrates. Toward the end of the Devonian, some 70 percent of the invertebrates disappeared, with the greatest losses among marine and, to a lesser degree, among freshwater species; coral reefs disappeared entirely. Estimates of the duration of Late Devonian extinction range from 500,000 to 25 million years. Although its cause remains unknown, it ranks as one of the five major extinction events in biota history. SEE ALSO: Fish (c. 530 Million BCE), Land Plants (c. 450 Million BCE), Amphibians (c. 360 Million BCE), Gymnosperms (c. 300 Million BCE), Coral Reefs (c. 8000 BCE), Paleontology (1796), Fossil Record and Evolution (1836), Continental Drift (1912). 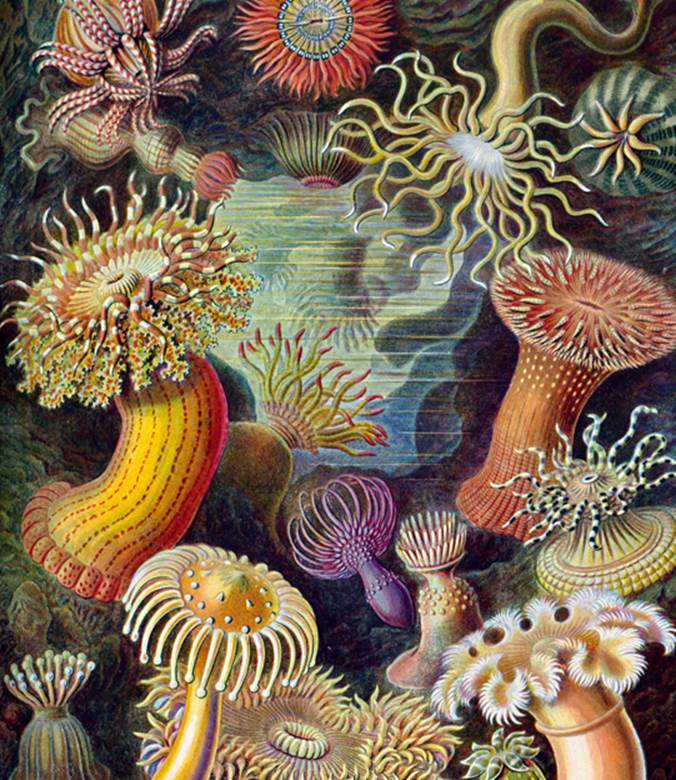 This image from Ernst Haeckel’s Kunsiformen der Natur (Art Forms of Nature) of 1904 shows various sea anemones, classified as Actiniae, which are water-dwelling, predatory animals that may have flourished in coral reefs during the Devonian period. Since most Actiniaria lack hard parts, however, fossil records are sparse.